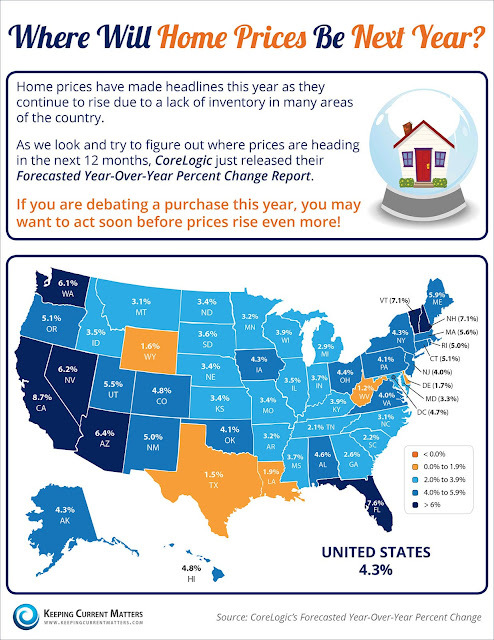 Houses & Homes VA: Where Will Home Prices Be Next Year? Where Will Home Prices Be Next Year? 25 states are forecasted to achieve higher levels of appreciation in the next 12 months than already achieved in the last year. 25 state and the District of Columbia are forecasted to experience a slow in appreciation. All 50 states & D.C. are forecasted to achieve some level of positive price appreciation. Even though each state is appreciating at different levels, you need to know the Cost of Waiting until next year to buy your dream home!